A random sampling of some of my gear & gadgets. More info below. Through experience alone, I’ve become pretty darn savvy with most aspects of computer hardware: internal components (motherboards, CPUs, RAM, hard drives, optical drives, video cards, network cards); peripherals (monitors, keyboards, mice, game controllers, audio, printers [but let’s be honest – does anyone even really like printers?? ]); and networking elements (routers and cabling and modems, oh my). I can get networks up and running, and (usually) effectively troubleshoot ones that are giving trouble. I know I have room for growth on security & scaling. Word: crazy mail merges, adaptive formatting, and above all: making it look good are all areas in which I take pleasure. Excel: three-or-four deep formulas (hello VLOOKUP and MATCH) & conditional formatting don’t scare me. Access: I’ll be honest; I’m not as good at Access as I want to be, mostly because I haven’t had the opportunity to get my hands dirty with a real-life “this matters” project. But I’m always on the lookout for one. Windows: I know a half dozen hotkeys that you probably haven’t even heard of. Google: Heavy user of Drive, GMail/Inbox, YouTube, Calendar, Keep etc for personal & work use. Apple: Not a hater. 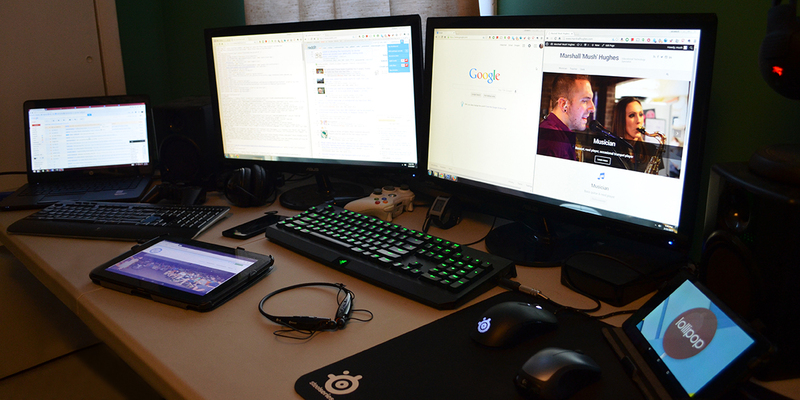 My main rigs are Windows based, but I can navigate in this ecosystem without flinching. Linux: Another instance of “I know the idea behind it but I’ve never experimented in depth.” Happy to change that if given the chance. I’m aware of what they are & how they can be used, but don’t have as much hands-on experience with them as I’d like. Yet. AP Computer science & enough hobby-related exploration to have a very solid grasp on core concepts, and the drive & determination to learn (or re-learn) whatever language the task at hand calls for. Through my work with the NEF, I’ve become familiar with the ins and outs of the Moodle content management system. Several iterations of courses developed in Moodle 1.9 & 2.x, with advanced features like achievements/badges & responsive directives based on past student performance.